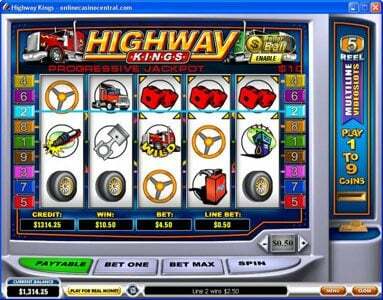 Highway Kings online slot machine pictures and slot feature list from Playtech, play Highway Kings Slots for free. 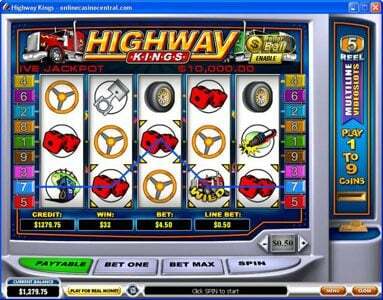 Highway Kings Slots has not been reviewed yet, be the first to rate this slot. Highway Kings is a 5 reel, 9 line video Slot game from Playtech offering a top fixed jackpot of 10,000 coins and multiplier values of up to 100x. Players have an opportunity of winning more than 50,000 coins in the Dollar Ball Progressive Jackpot. 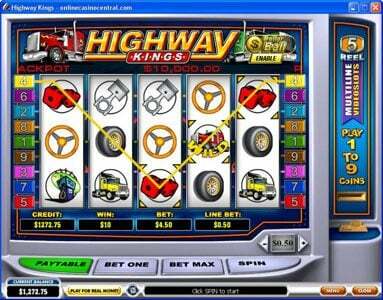 Highway Kings Slots offers a variety of gaming features to include the wild multiplier, and the scatter. Although it does not offer any Bonus feature game, it offers great gaming action that will keep you glued to your seat for hours. 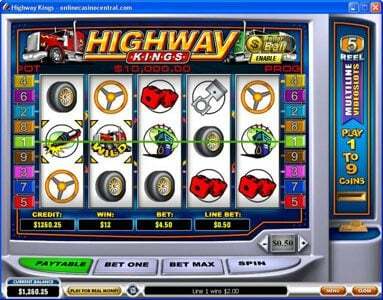 Highway Kings is based on a classic slot theme and delivers cool graphics and sound effects. 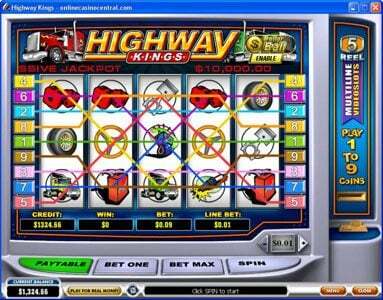 The software allows you to adjust the game speed as well as the sound and players are able to make use of the autoplay feature that allows you to set the number of coins to be played out automatically by the machine. The icons showcased on the reels include the Red Diesel, Green Diesel, Yellow Diesel, Gas Pump, Gas Can, Dice, Glow Plug, Piston, Tire, and Steering Wheel. 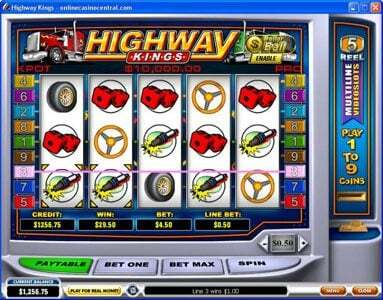 Highway Kings offers more than 15 payout combinations and this slot game suits low to medium wagers. It offers a coin denomination of $0.01 - $5.00 and allows players to wager a max of only a single coin per payline. Players can wager a max bet of $45 per spin and allows a minimum bet of $0.01. The Big Red Truck icon is the wild that appears on all 5 reels and substitutes all other icons to complete possible payout combinations. For each payout completed by the wild, the payout is doubled thereby the Big Red Truck icon acting as a wild multiplier. The wild does not substitute the scatter icons. 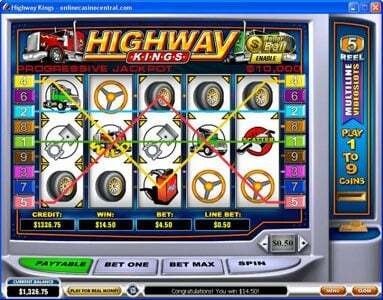 This slot gam uses two scatters – the Muffler scatter and the Birds Nest scatter. Both scatters show anywhere on the reels and award scatter multipliers of 1x up to 100x. The Dollar Ball Progressive Jackpot is a lotto style feature that allows you to select 5 numbers between 1 and 49 when the game starts and it will display 5 random numbers during game play at which if they match, the progressive jackpot is triggered. 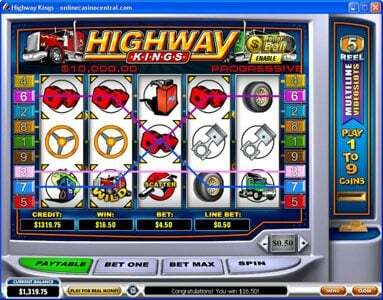 If you are feeling lucky and you think you have the lucky numbers then play Highway Kings slots from Playtech.